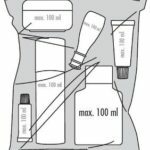 Suggestions on how to pack most efficiently for any type of trip. Most travellers I know aim to travel with just carry-on baggage but most often end up checking their bags because it takes far too much time and effort to pack smart and efficiently. Most of us pack far too many clothes than we will ever need because doing so requires much less thought when packing. Just throw everything in that suitcase and don’t worry about it right? 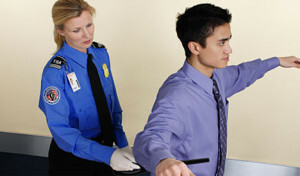 The typical airline charges $25US per checked bag and up to well over $100 for bags that are overweight. By keeping your personal articles to a minimum, you can save up to over $200 per return flight. 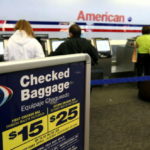 Recently however, due to long TSA wait lines, some airlines are dropping baggage fees in order to expedite the security wait times. If you are checking a bag, be prepared to add at least 1 hour minimum to your transit time. 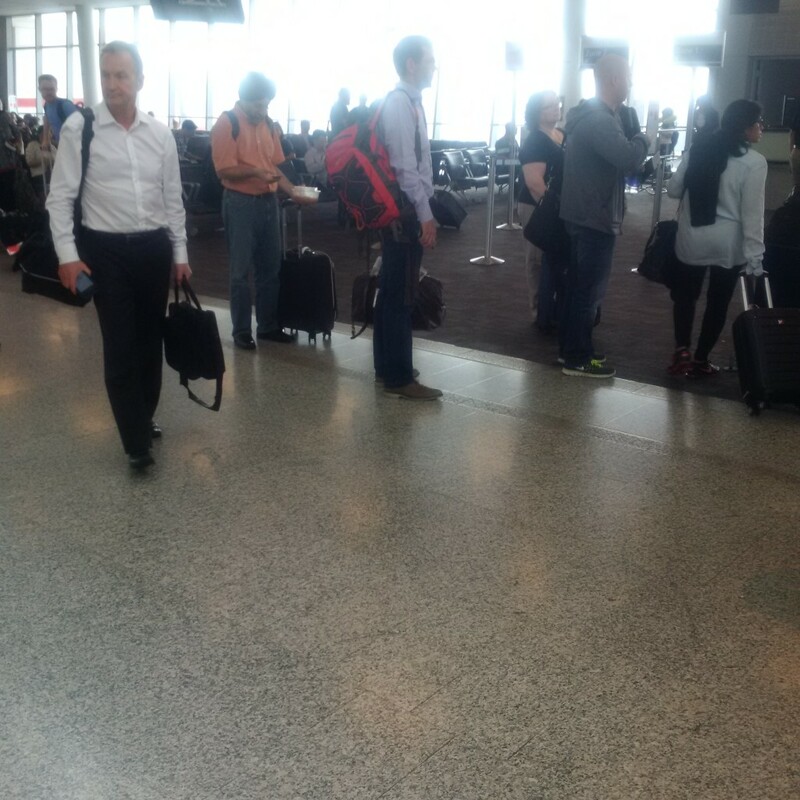 Instead of simply printing off your boarding pass and proceeding through security, you will have to tag your bag and line up to drop off your bag. This process alone can take an hour so if you are planning on checking a bag, be sure to arrive at the airport at least 2 hours early for domestic flights and 3 hours for international flights in order to ensure you have enough time to drop off your bag and go through security. 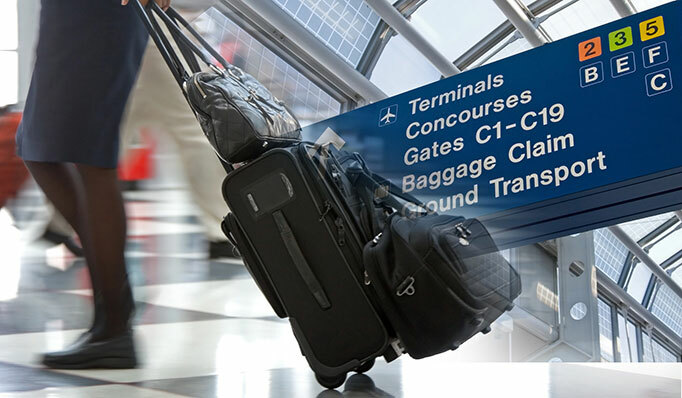 Furthermore, when you arrive at your destination, typically you will have to wait an additional 20-30 minutes for your bag to be available for pick-up at the baggage claim carousel. 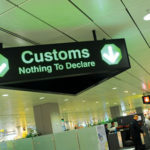 For international travellers, this wait may be even longer given that customs agents may be searching your bags prior to putting them on the carousel. What better things could you be doing in those 20 minutes? Be at your hotel, sipping on a nice glass of chardonnay? Sign me up! I don’t know about you but every time I’m waiting at the baggage claim, I always fret over the fact that my bag might not make it. I neurotically think of what time I checked-in for my flight and what order my bag should be in as it was loaded and unloaded on the plane. Fortunately, I have not ever had one of my bags lost but one time I had to wait almost 3 hours after returning on a flight that arrived at midnight. I was not a happy camper by the time I claimed my bag at 3am but nonetheless, I was pleased that I did get my bag! It’s quite simple: if you have limited or no space in your bag to put anything else in it, you don’t have the option to buy things and bring them home, well unless you buy another bag! Can’t fit much more than a laptop case in this bin! 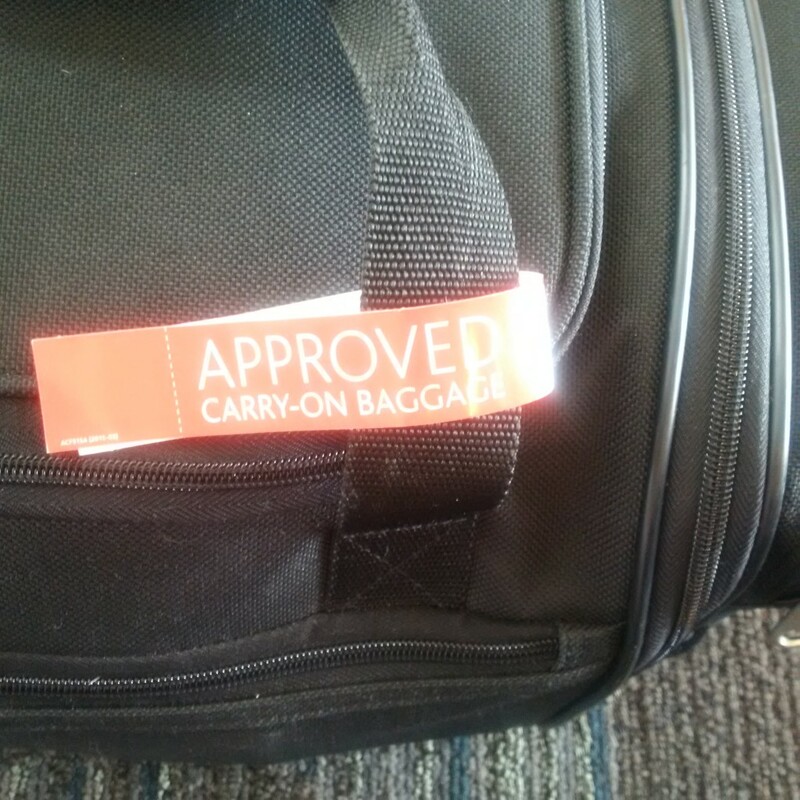 Ever go to a luggage shop and see luggage labelled as “Carry-On Approved Luggage”? Or even try out the airline’s “Carry-on Approved Luggage Sizes” bins at the airport? Well sorry to disappoint, all that is meaningless and rather completely dependent on the type of aircraft you will be flying on. 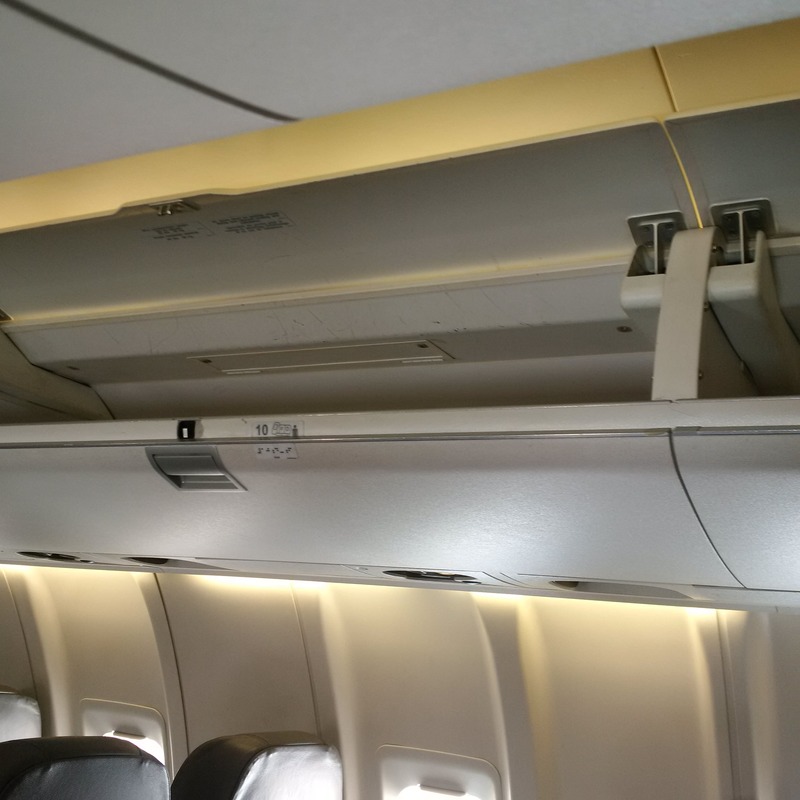 Each aircraft has VERY different overhead bin storage space and there are some aircraft such as the dash series which won’t fit much more than a laptop case! Travel Tip: I always travel with an extra small bag/purse within my larger carry-on which contains all of my electronic devices (cell phone, chargers, etc). Note the small purse in the left of this photo which I store in my larger carry-on below. This way if you are on a small aircraft where your bag won’t fit and you have to use the sky-check service, you can quickly remove any articles which cannot be checked (i.e. anything containing a lithium ion battery). As I mentioned previously, if you are just travelling with carry-on, you have limited space in which to place any additional articles which ultimately limits you in terms of what you can purchase throughout your travels. 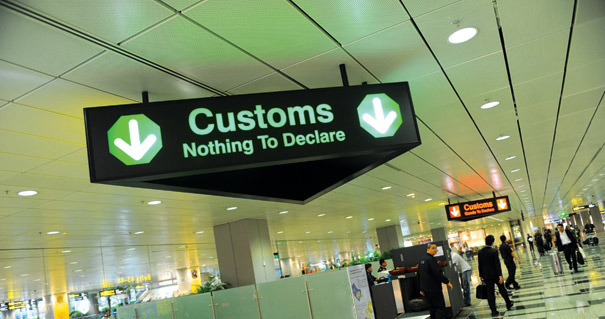 Several times, well more often than not, I travel with only carry-on and do not purchase any items while abroad and therefore have nothing to declare at customs. Apparently this must be some sort of red flag or perhaps a red flag only because I am a female and I should be bringing multiple bags and shopping everywhere I go? I have wound up in secondary screening almost every time I travel with carry-on only and have nothing to declare. Being subject to secondary screening is time consuming and anything but fun. At minimum, it may add 1 hour to your journey and if you have been travelling for a long time, this is the last thing you want to have to go through! As a side note, if you are travelling internationally, ALWAYS DECLARE EVERYTHING HONESTLY and IF IN DOUBT, DECLARE IT! Not properly declaring items is a serious offense! This is probably the biggest challenge for most travellers; Being able to pack all of your necessities in such a way that it meets carry-on requirements. 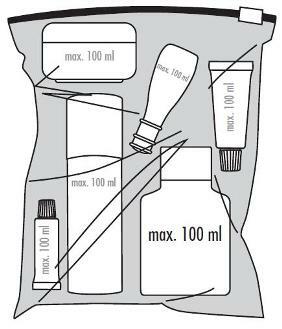 Liquids and gels are limited to a maximum of 1L total comprising of bottles that contain a maximum of 100 ML each and that is very difficult to do, especially if travelling for more than a few days at a time. 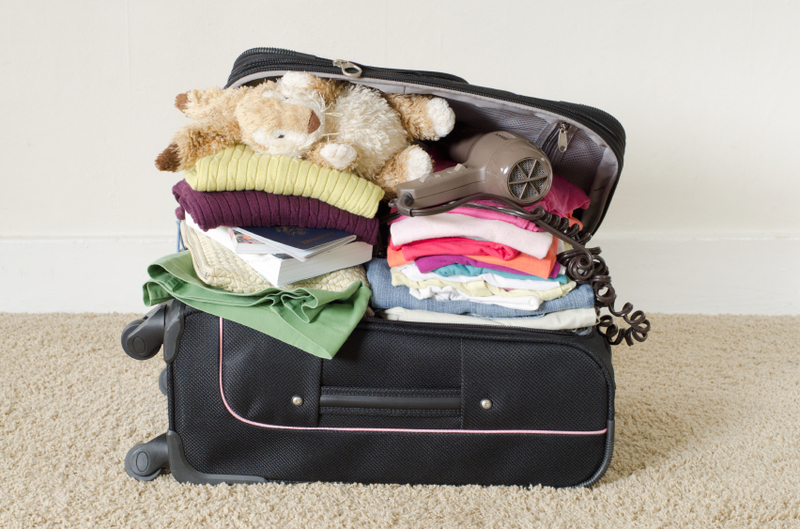 Clothing can be packed minimally especially if your hotel has laundry facilities but shoes however cannot. If you are planning on travelling with just carry-on, I recommend wearing all of your bulkiest items (boots, jacket, etc.) during transit. In reading this, I hope that my points will better prepare you for your next trip. 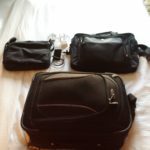 This entry was posted in Packing for any trip, travel, Travel Tips, Up in the Air and tagged airline travel, baggage fees, carry-on, checked baggage, customs, declaration, packing, security, travel, travel tips on June 9, 2016 by TravellingSaleswoman. It is with great sadness that one of my loved ones was unable to make it back home to Canada for Christmas. Why was he unable to? Because he was denied boarding. Why was he denied boarding? Not because the flight was overbooked. Not because the flight was cancelled. Not because he didn’t have a seat. Not because he was drunk and unruly. Not because he was on the no-fly list or any other obvious reason. He was denied because his passport was damaged. Most of us take good care of our important documents but we are only human and it is so easy to have an accident and damage those documents. Unfortunately most of us don’t even realize what small “damage” to a passport can cause you to be denied boarding a flight and hence the reason I am writing this post. 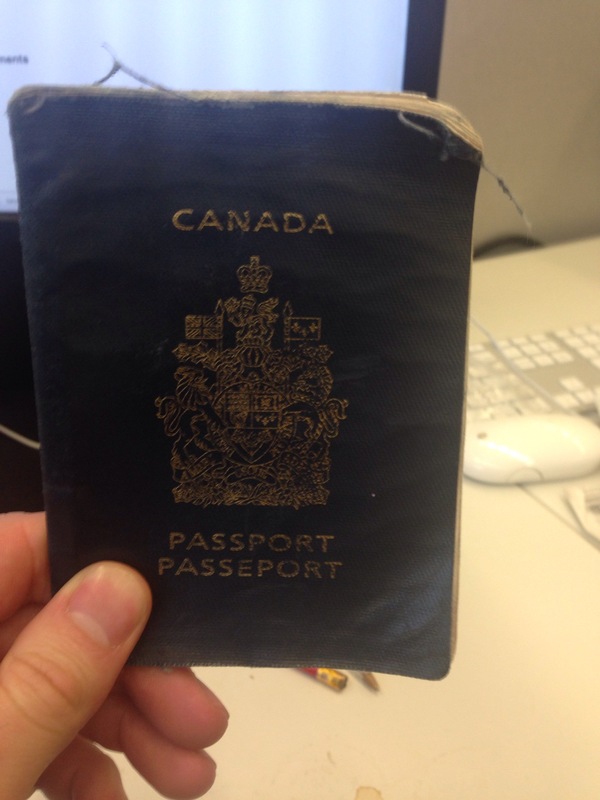 The worst part is, in Canada if you have to replace a damaged passport, you must complete a comprehensive general application and will not be able to simply renew it and this process can take weeks if not longer. could potentially cause problems or has been denied by an airline or at a point of entry due to perceived damage. A few years ago when I was in Grenada, I was almost denied boarding a flight back to Toronto because of my passport photo. Wow! Was I ever sweating!! My heart sank right into my stomach because I had no idea what he was talking about. I was taken into an interrogation room for a more detailed search of my belongings and asked many questions. 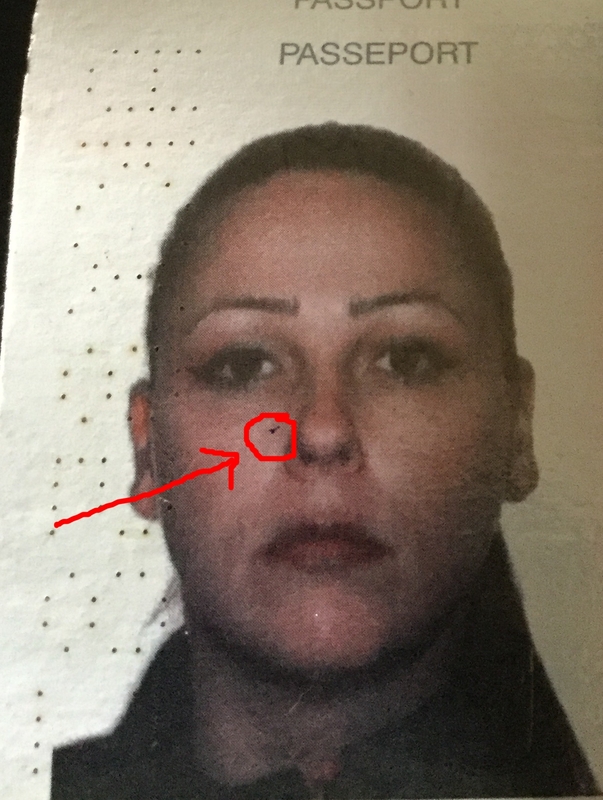 As it turned out when I was entering Grenada, the officer stamping my passport accidentally put pen marks on my passport photo page AND on my face in my photo! Fortunately, the pen mark was in blue, there were multiple other pen marks on the page and I had several other pieces of photo ID so they let me pass. I was sure to renew my passport well in advance of my next trip because I didn’t want to risk getting stuck anywhere again over something so silly. There are a multitude of reasons that a traveller may be refused boarding or entry/exit into a country but don’t be one of those people. Be sure to add “check the condition of your passport “ to your pre-travel checklist and do this well in advance of travelling. If you are unsure about the condition of your passport, visit a local passport office or contact your airline. Safe travels my friends. I hope you all have a wonderful Holiday Season without hiccups such as these. This entry was posted in Detours, Packing for any trip, Road Woes, travel, Travel Tips, Up in the Air, Warnings and tagged check your passport, Christmas, denied boarding, flight, know before you travel, travel, travel tips, unexpected events on December 23, 2015 by TravellingSaleswoman. Now that summer has officially ended, it’s the perfect time to start planning your next vacation or plan that next work trip. 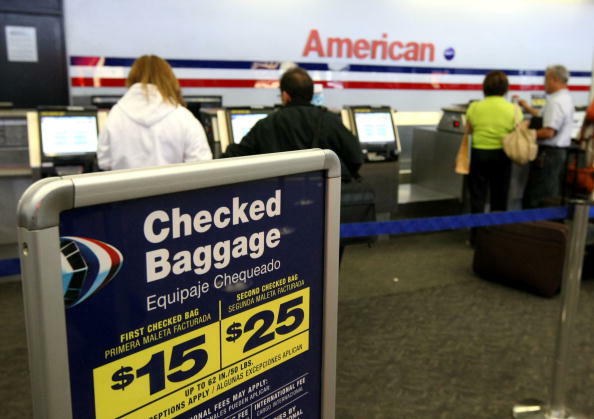 After all, flight prices are historically the lowest in the month of September. If you’re flying somewhere, I’m sure you’re like most people who absolutely dread the thought of passing through airport security screening. It can be a timely and intimidating process. What aggravates me the most is that although the process is quite simple, so many people are completely clueless or just pretend to be ignorant of the rules and cause unnecessary delay and headaches for everyone else because they are unprepared! 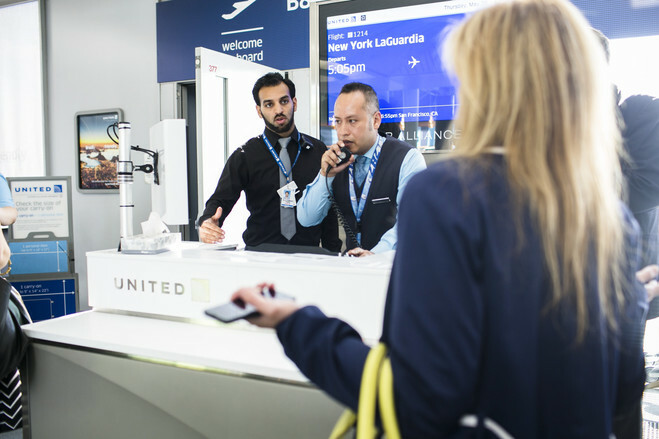 In this article, I will provide some useful tips and tricks of the trade that will help you better prepare for your next flight so that you (and your fellow travellers) can breeze through airport security. Enlist in a Trusted Traveller Program. These passes enable you to bypass regular line-ups because you have been pre-screened. It is quite a process to get one of these cards but trust me, it’s worth the 2 hours of interviews and the $50 even if it is just to save yourself sitting in line waiting for 2 hours on a single flight! My Nexus pass is the best investment I have ever made. 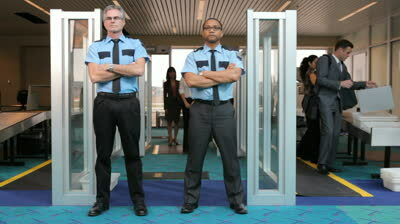 To learn which would be the best for your travel needs and how to apply, visit US Customs and Border Protection Website. Invest an Airport Lounge Pass (if you fly more than 3 times per year). Airports are expensive places to be held captive. One time I had the “cheapest glass of wine” at an airport bar in SFO which was $27 before tax and tip! Yikes! 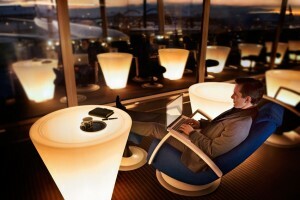 If you’re stuck only a few times per year for a few hours at a time, it is definitely worthwhile to invest one of these lounge passes because for whatever you pay for that pass, you will get your money’s worth in food and drink that you won’t be buying at airport prices like a sucker. If you travel frequently, you come out well ahead! Visit Your Local Travel Health Clinic (Foreign Travel Only). Some countries have endemic diseases for which you will require vaccination before you travel. More exotic countries require several vaccinations that require 2-3 boosters that are to be administered weeks apart and you must have all of them in order to be fully immune. Printed Copies of Your Itinerary (Boarding Pass, Copy of Hotel and Rental Car Reservations). You never know when you will lose wifi access, if your phone battery will die or if you lose your phone all together! Phone, charger and other electronics stowed in your carry-on. Any device containing a lithium ion battery is considered a dangerous good and cannot be checked. You will also likely need to charge your devices in the event that you did not do so prior. To save time and aggravation (for you and other travellers!) before you even line up at the security gate, step aside, sit down somewhere comfortably and remove the following items in ADVANCE. You WILL have to remove these from you carry-on at the check point, so if you ensure that these are all easily accessible and can be easily put back into your luggage so you don’t struggle with them and cause any unnecessary delay. Empty your water bottle if you will be bringing it with you through security. It sure is better than tossing it in the garbage and paying $7 for a new one after security. Boarding Pass (last)– Once you have all of your other things in order, keep your boarding pass tight in hand. Do NOT store it in your suitcase! I can’t count the number of times I have seen people do this!! Shoes with a heel or thick sole (pumps, running shoes, boots, etc.) Pretty much anything except flip flops. Try taking them off while you are waiting in line to save time. They need to be in their own bin and its best if they are the first of your items to go through the scanner because they will be the first ones out of the scanner after you pass through. Make sure you know where your gate is and go to the airport lounge, sit back, relax and enjoy all the “free” food and drink you can until 30 minutes prior to boarding. I hope some of you less frequent flyers find this information helpful. If I can only save a handful of you, I feel like I’m making a difference. This entry was posted in Packing for any trip, travel, Travel Tips, Up in the Air and tagged airline travel, airport security, travel, travel tips on September 9, 2015 by TravellingSaleswoman. 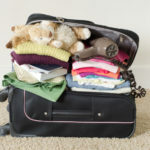 In late May of this year, Air Canada announced that they will begin to enforce the carry-on baggage allowance at major airports across Canada. Last week, I travelled on Air Canada and experienced this process first hand. I must say, I was quite impressed. At check-in, Air Canada had several staff members approaching everyone at check-in to assess their carry-on baggage, measuring it if required and then affixing a “Carry-On Approved” sticker as shown. Upon my arrival at the gate, I was pleasantly surprised to see how the majority of travellers had appropriately sized carry-on luggage. This was a dramatic improvement over all of my previous flying experiences, especially after Air Canada introduced their policy to charge a $25 fee for the first checked bag. When they implemented that policy, almost everyone had 3 bags and usually one of them was oversized. This is extremely aggravating for us business travelers who generally speaking have appropriately sized carry-on that cannot be checked. I used to dread the boarding process, looking at all of the other travelers with all of their huge bags and stressing out over if I will have room for mine. 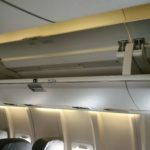 To get around this, I would always book a seat near the rear of the aircraft so that I would board first and if the overhead bins above my seat were already full, I could stow my briefcase in any bin in front of my seat. In spite of Air Canada’s efforts to enforce their carry-on policy, there were a handful of passengers who slipped through the cracks like this lady in the photo below. From her bag tags, I could see she was a frequent traveler so there is no excuse. While boarding the aircraft in single file, she even had the nerve to push me aside and bud in front of me! Now that most certainly isn’t frequent flyer etiquette! After boarding was complete, the flight attendants announced that the overhead bins were full and asked some passengers to volunteer checking their bags. I’m still not sure exactly how this happened since >90% of the passengers had appropriate carry-on. However, I suppose all it takes are a few Carry-on Cows like that woman to slip through the cracks and disrupt the system. In the end our flight was delayed approximately 20 minutes as the flight attendants tried to find passengers who were willing to check their bags. So overall, the enforcement process was great not but entirely effective. 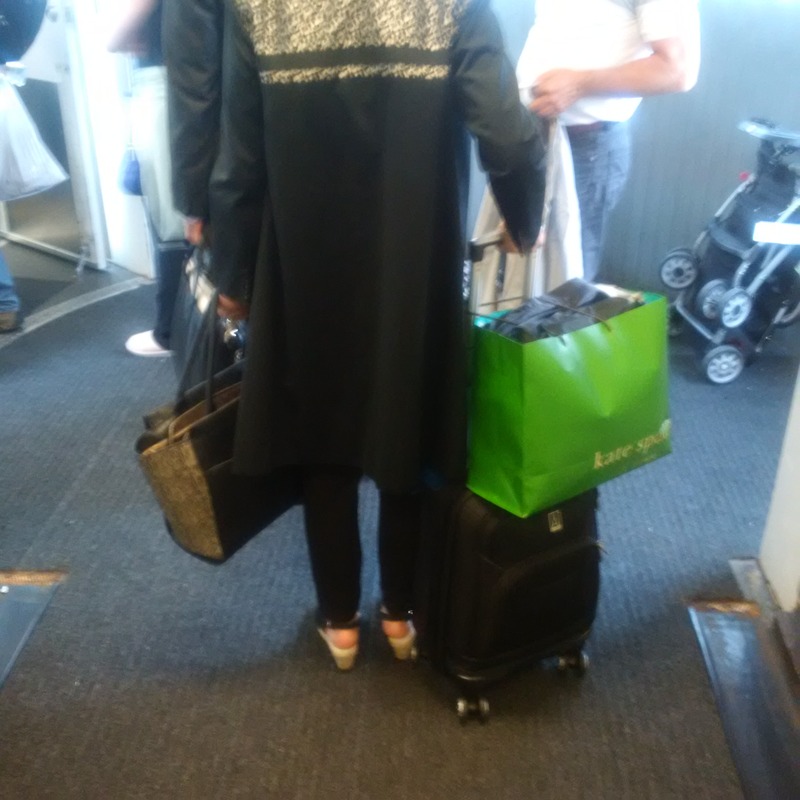 In my opinion, I think that it would be much more effective if at the security checkpoint, all carry-on bags should be double-checked to make sure that they have the “Carry-On Approved” tag and passengers who have more than 2 bags, should not be permitted to go through security. Safe travels my friends and don’t be shy to speak-up to those Carry-on Cows! 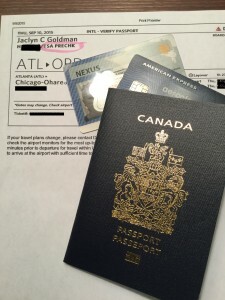 This entry was posted in Packing for any trip, Passenger Shaming, Road Woes, travel, Travel Tips, Up in the Air and tagged Air Canada, carry-on, Carry-on Cow, enforcement, luggage, packing, travellers on July 2, 2015 by TravellingSaleswoman.